So, I have just turned 26 years old, just four more years until I reach the big 3 o. I am both happy yet anxious because of all the plans I need to iron out for a more stable future and I have to keep on being consistent in everything I do. 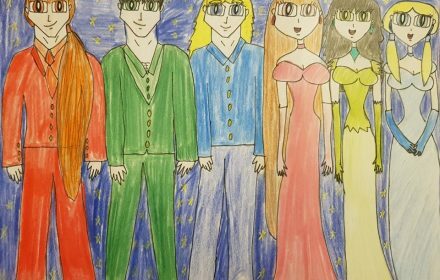 So, in honor of my very special day, I decided to draw the now grown-up Rowdyruff Boys and Powerpuff Girls looking really sharp tonight. In my headcanon, these two teams ended up becoming one grand superhero team, known as Team Xtreme, while they were still kids and have been on several missions from fighting monsters, beating criminals, battling supernatural forces and balancing all that with school, work, and other endeavors. Moreover, while the Powerpuff Girls have their parents, Professor Utonium and Miss Keane, known in my headcanon as Mrs. Keane-Utonium, I decided to let the Rowdyruff Boys be away from Mojo Jojo and Him and be adopted by Mr. Green and Miss Sara Bellum, known by her married name as Mrs. Sara Bellum-Green. No worries, I will definitely make fanart out of these two families, one when they were children and one when they are grown up. So, without further ado, here’s Team Xtreme from left to right. 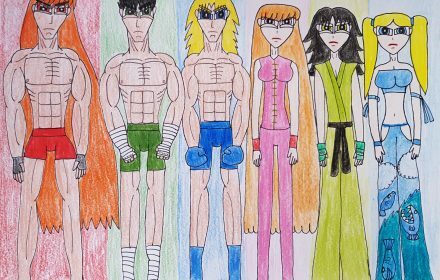 Brick “The Lord High Bludgeoner” Green, aged 25 going on 26 Butch “The Baron of Brawn” Green, aged 25 going on 26 Boomer “The Fleet Athlete” Green, aged 25 going on 26 Blossom “The Commander and the Leader” Utonium-Green, aged 25 Buttercup “The Toughest Fighter” Utonium-Green, aged 25 Bubbles “The Joy and the Laughter” Utonium-Green, aged 24 I hope you enjoy this piece of work and I will definitely see you on the flip side. Take care. The Rowdyruff Boys (Brick, Butch, and Boomer) and the Powerpuff Girls (Blossom, Buttercup, and Bubbles) belong to Craig McCracken.